While hundreds of hockey fans were sprinting through Monday night's downpour to catch the Stanley Cup Final, about 40 music fans gathered outside, near a roped-off Wrigleyville parking lot, drenched. 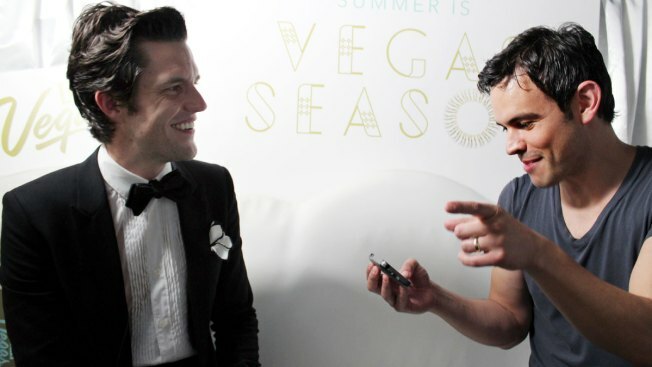 They were hoping to see a free performance by Brandon Flowers, lead singer of Las Vegas-based rock band, The Killers. Flowers was in Chicago with the Las Vegas Convention and Visitors Authority (LVCVA) to promote Vegas tourism with an event called "Vegas Season Pop-Up." He was also scheduled to sing "Take Me Out to the Ball Game" during the 7th inning stretch of the Cubs-Indians game. Steady monsoon-like rains and -- at one point -- a blaring tornado siren made the Cubs' decision to cancel the game a no-brainer. It wasn't long before the Vegas contingent did the same. "I almost walked away because I knew there was no chance of an outdoor show in that weather," said Eric Johnson of Chicago, a longtime fan of The Killers. According to a Cubs representative, when the singer saw the soaked faithful from inside his limo, rather than cancel, Flowers decided to bring the group inside Wrigley Field for a private set. "One of the crew members walked to us in line and said, 'You all are going to be very happy," Johnson said. Each fan was given a wristband, led inside through a small entrance off Addison Street, then upstairs to a private room in the upscale clubhouse under the right field stands. Flowers treated them to an intimate, five-song set without microphones or amps -- just vocals accompanied by two acoustic guitars. He performed a cover of Elvis Presley's "Viva Las Vegas," two songs off his new solo album The Desired Effect ("Lonely Town" and "Diggin' up the Heart") and stripped-down versions of Killers classics "When You Were Young" and "Read My Mind." "[It] really showed his character," said Johnson. "Truly a class act." AP: What went through your mind when you saw your fans standing out in the rain? BF: I felt bad, really. This is something I've been looking forward to and I was also supposed to sing "Take Me Out to the Ball Game" in the 7th inning, and that got shot down because the game's cancelled. But we ended up being able to play for the people that did wait out in the rain, so that did work out. AP: It looked like you made an effort to make eye contact with every fan during the performance (at one point, Flowers jumped on a chair to see the people standing in back)...what's that about? BF: You always hear about people on stage saying they can't see anything. But in my experience, I can always see everything. So maybe it's become part of my experience, making that contact with people. I just find that it makes me more comfortable, and they seem to like it. So it works out. AP: Your new solo album, The Desired Effect, seems to be getting almost universally positive reviews. Are the other three members of The Killers psyched for you, or are they threatened by it? AP: I heard you say that in one track on TDE, you wanted to tell a very specific narrative about a very specific character. What is the song and who is the character? AP: You've repeatedly said that many of your songs simply "come to you." Where do they come from, and what's your advice to other musicians who want to tap into that part of their consciousness? BF: I think [the songs come] the more that you really give it a shot. Don't worry so much about your hair, or what everybody else is doing. I think you just really gotta keep going back to it. Keep trying. Then it becomes almost like muscle memory. And then your problem is just deciphering what's good enough from what isn't. Sometimes I succeed and sometimes I fail at that. AP: Did you see the Rolling Stone article that came out a few years back, where readers voted Sam's Town the most underrated album of the 2000's? BF: I heard about that. AP: Did you feel vindicated at all when you read that? AP: You said one time that "A Dustland Fairytale" is your favorite song you've ever written. Is that still true? If not, what has replaced it? BF: It would have been that, but I'll tell you: we've been doing "Read My Mind" lately on my solo tour and we reworked it a little and it's just made me reflect on it. It's going to be 10 years old. And I just think, damn, I'm just so proud of that song. I love "Read My Mind." AP: What do you want Chicagoans to know about your hometown of Las Vegas? BF: It's really like a small town. It's not this metropolis. You can go to the city and you can have the whole Sin City experience, but you can also have a normal existence outside of that. I love that I have those options. I also love the desert. It's beautiful. It's not just dirt; it's not just brown. It's magic; it's majesty. Anthony Ponce is a reporter and anchor for NBC Chicago, a huge Killers fan, and made it home for the second and third periods of the Blackhawks game. Follow him on Twitter @AnthonyPonceTV.